As far as naming goes, I like to use Þórr, rather than the anglicized Thor – but then no one would ever find this page! Now that you’re here, though … it’s Þórr all the way. Þórr is attested to in numerous textual and artifact sources, not the least of which originated with the Romans, who loved to lump in outside deities with their own. He was known by Jupiter or Hercules by the good ol’ Romans, and the Roman historian Tacitus lists him as Hercules in his Germania, which was preserved so that we may read all of the other skewed rubbish the Roman’s heaped upon the entire pantheon. The oldest known instance of his name, however, belongs to a fibula (a type of brooch) dated to the 7th century, called the Nordendorf Fibula and unearthed in Bavaria. The inscription, in runes, calls him Þonar, a Germanic form of his name. Þórr is also attested in the Gesta Hammaburgensis Ecclesiae Pontificum by Adam of Bremen, the Poetic Edda, Snorri Sturluson’s Prose Edda and Heimskringla, and the sagas. As the son of Óðin and the giantess Jörð (the embodiment of Earth) Þórr is the Æsir god of thunder and lightning, and is a protective god who reigns in the destructive race of jötunn and makes Miðgarðr safe for humans, as well as the Æsir. He is also famous for hunting down trolls, and old legends say that Scandinavia is free of trolls and giants only because Þórr is so efficient with his hammer strikes. There are many such stories of Þórr battling with giants, and the best known are probably his duel with Hrungnir, and his encounter with Útgarða-Loki, a king of the Útgarða jötunn kingdom. His battle with Hrungnir is so fierce that a piece of whetstone is lodged in Þórr’s head, never to be freed. On his adventures to find Útgarða-Loki’s kingdom, he is repeatedly tricked by the giants’ magic, which is humiliating and frustrating for he and his adventuring companions, and in the end when the deception is revealed, King Útgarða-Loki admits the real strength of the gods will destroy the giants, and seals away his kingdom from the gods forever. Þórr’s adventure stories are usually filled with good humour and lots of action. In another famous story, he misplaces his magical hammer, Mjölnir, and the giant Þrymr absconds with it. Þrymr decides to ransom the hammer off for the hand of Freya in marriage, and the gods’ solution to this dilemma is to dress Þórr up as a bride and send him to the wedding instead of the goddess. Loki attends as his handmaiden, shenanigans ensue, Þórr loses his temper, and the entire house and all its inhabitants are leveled in the end. Later on, as the rest of his kin are crossing Bifrost to reach the well of the Norns, Þórr is given the option of leaving Mjölnir in Heimdallr’s care or wading across a freezing river … and he chooses to hold onto his hammer and wade. He arrives just as business is concluding and has to wade back. Þrúðheimr (World of Strength) is the realm of Þórr is Asgard, where his hall Bilskírnir is located. He is the red-headed and bearded husband of Sif, the golden-haired goddess, and he has several children – Þrúðr, Móði, and Magni – and a step-son, Ullr. He is often seen travelling with Loki, and the two are a comical pair, but as Loki’s attitude towards the gods slowly changes, so too Þórr becomes increasingly more threatening towards his once steadfast friend. At Ragnarök, he is fated to battle Loki’s son (and monster) Jörmungandr, which ends with the two of them killing each other. Not content to wait until the end of the world, Þórr bates the mighty serpent, which is lying at the bottom of the sea, with the head of a giant ox. The serpent escapes at the last minute, of course, and the thunder god only succeeds in freaking out Hymir, his giant boating companion in the story. Þórr is the patron of the blue collar working classes of the various ages. He is very friendly, direct and honest, and often jovial in his stories, and working with him is usually like having a hulking older brother hovering over your shoulder, giving your antagonists the stink eye. He is a god of industriousness. As the defender of Miðgarðr, Þórr is constantly battling the jötunn in his stories. I usually interpret the jötunn to be the elemental forces of the world, which in ancient times were very literally deadly to humans. Back in the day, a life expectancy of 30 was pretty average, and someone who lived to 40 was considered old … nature wasn’t kind to us, and so our pal the thunder god kept it under control. Today, the balance of nature is weighted in exactly the opposite way, with the human race well and truly ransacking the elemental world, and so in modern times Þórr helps restore and preserve the jötunn – for our own good. He (and the other Æsir) have always been concerned with our survival, and living peacefully alongside the jötnar is essential towards this goal. In fact, the Æsir are famously a mix of several races, including giants, and Þórr himself has a giant lover, Járnsaxa. You can honour Þórr by striving towards honesty and directness in your dealings. He appreciates bluntness – not always hit-it-with-a-stick bluntness mind you, but gentle bluntness is acceptable as well – and isn’t always the best at being tactful or diplomatic. There are certainly times where diplomacy is the way to go, but as far as he’s concerned, just laying it all out on the table is never the wrong option. In conflicts, the direct and honest approach is Þórr’s. He won’t tolerate beating around the bush. His hammer is one of the primary symbols of Northern Tradition paganism, historically as well as today. 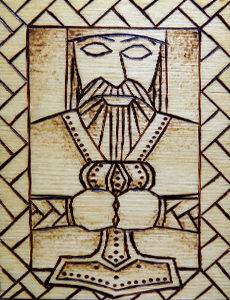 His old English name, Thunor, and Old High German name, Donar are related to the modern English word “thunder.” Making the hammer sign is a popular heathen modern ritual, which, invoking Thor is used to bless food and drink, bless a celebration or special event, bless a ceremony, such as a blót or sumbel, and to ward against negative energy. He is often invoked in the blessing of a new home. Many heathens wear his hammer as a sign of faith and protection. Thunder, lightning, rain, wind, and storms. Redheads and quick tempers. Goats and other horned beasts. All trees, especially oak, and lightening rods. The day Thursday. Beer and hearty food. Hammers, flint and whetstones. Onions, garlic and leeks. Gauntlets, sports girdles and gear. Colours: sky blue and red. The rune Þurs.